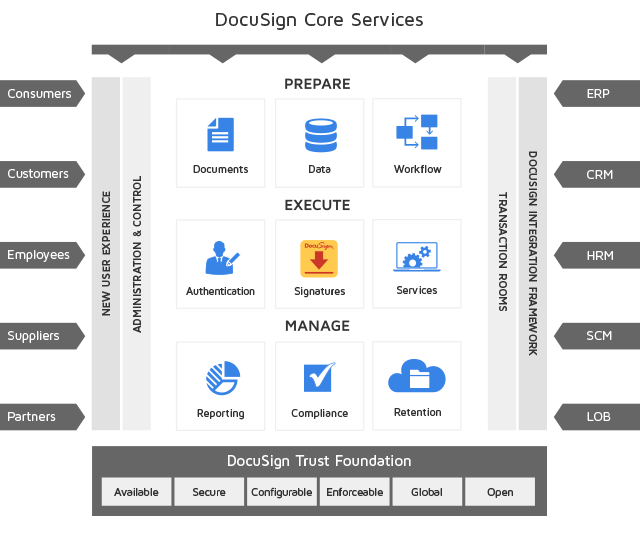 As the global standard for Digital Transaction Management, DocuSign is leading the way in helping organizations deploy DTM. 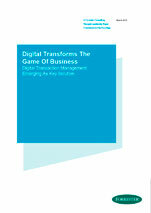 Some companies take a holistic approach to DTM and launch a company-wide initiative in order to gain value quickly. Others start with a specific departmental need or use case and expand it throughout their organization, creating their digital workflows and reaping company-wide benefits over time. Users prepare for transactions by establishing the order in which things are to be completed and the roles associated with each step. 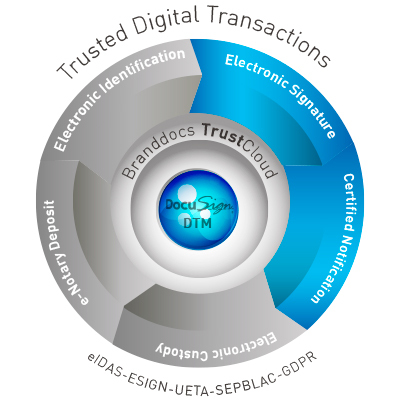 Transactions are executed with company-level security and advanced authentication methods in order to validate the identity of the signer. The resulting e-Signatures are considered more legally enforceable than those performed with pen and paper. Complete information is captured and retained for ease of reporting and proof of compliance. DocuSign is a complete beginning-to-end DTM solution that readily integrates with existing digital systems (including CRM, HRM, and ERP) and is easy enough for anyone to use. It is also mobile-enabled, has a security encryption shielding the entire process and is legally accepted worldwide. Immediate financial gains: by reducing the transaction time, organizations see immediate financial benefits in weeks rather than months or years. Transforms the customer experience: instead of waiting days, week, or even months for transactions to be completed, progress can be made almost instantly. This speed delights external and internal customers and elevates the position of the organization that provides a superior service. Readily demonstrates compliance: every document has an easily-accessible digital audit trail to making documenting compliance for industry laws and regulations fast and easy.